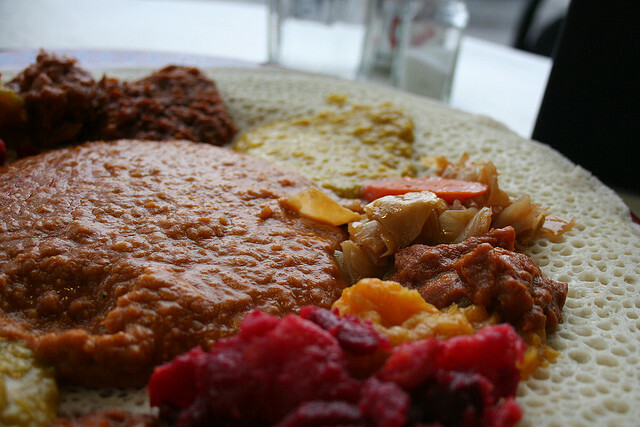 The menu at Caboose Cafe showcases an eclectic mix of Ethiopian and American cuisine. The Ethiopian portion of the menu is a nod to the founders of Caboose, who have roots in Ethiopia, and the American eats represent some of their favorite dishes from the U.S. Whether you come in for breakfast, lunch, or dinner, you can expect the unexpected at Caboose Cafe. For instance, there's the unique breakfast beef scramble, which comes on a crusty mini-baguette and the spinach burrito stuffed with egg, greens, and feta cheese. After 5 p.m., the dinner menu offers up options like the eggplant parmesan, the island salmon with Jamaican relish, and the rosemary chicken with rice and veggies. The Ethiopian portion of the menu showcases traditional entrees, such as vegan miser watt—lentils with onion, garlic, and berbere—and chicken infillay, a mix of chicken, tomatoes, onions, and spices. True to Ethiopian tradition, each dish comes with spongey flat injera bread that eaters used in lieu of utensils to scoop up the food.